A safari in Tanzania should always begin in the Serengeti, but there’s much more to explore. Wildebeest are seen at sunset in the Serengeti in Tanzania. 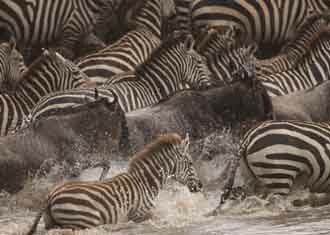 Wildebeest and zebras rumble across one of the world’s biggest nature reserves during annual migrations. SELOUS NATIONAL PARK, Tanzania — The hot African sun was unrelenting, the sky broken only by an occasional wisp of cloud. 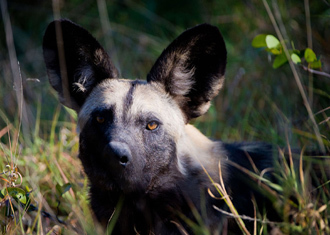 My guide, Mtambo, and I were alone in the Land Rover for an early-morning game drive. As he drove through Selous National Park, gazing at the verdant treetops for an elusive leopard, I glanced at him. Mtambo, of the Ndengereko tribe, was of an indeterminate age. He could have been 40 or 70, but this much is known: He can identify every African critter or bird that crosses his path. He pointed out an ebony tree, all gray and gnarled and not black as I thought it would be. “It is black inside,” he said in a pure and simple declarative statement before driving on. A few minutes later we stopped in a clearing framed by acacias and baobabs. Mtambo shut the engine, and for long minutes we just listened to the sounds of Africa: the softest of winds whirling around as rhythmic as iambic pentameter, the high pitch of a bazillion insects and birds. A bazillion of those, too. All around us was an avian orchestra of calls, songs, whistles and tweets. Above the crazy din, a hornbill trumpeted “wah-wah-ned!” I thought it was a baby’s cry. But no leopard, at least not on that day. Leopards don’t come out on cue, and neither does any other African wildlife. But on safari, there are always surprises and elements of danger, plenty enough to satisfy a sense of adventure and curiosity and develop a healthy respect for the natural world. 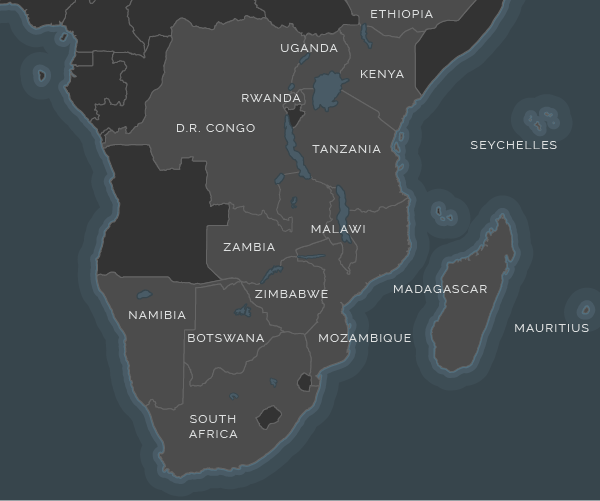 Tanzania, in East Africa and surrounded by geographical treasures of the Serengeti, Ngorongoro Crater, the Indian Ocean, Mount Kilimanjaro, Lake Victoria, Lake Tanganyika and Lake Malawi, is a melding together of Tanganyika and Zanzibar. 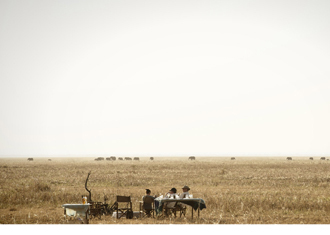 The Singita Sabora Tented Camp borders a windswept plain where you can see forever. Evening brings all sorts of animals close to camp, and all night buffalo snorted, lions roared and hyenas barked just steps away. We hunted for cheetah instead, finding a pair of young males resting in the shade of an acacia, their colors blending in easily with the warm notes of Tanzanian earth. We were greeted at Faru Faru with big glasses of sweet iced tea and a lunch of fried fish. Who knew you could get touches of Georgia it in the heart of the Serengeti? Just a few minutes into our next game drive, Arnold’s radio crackled to life from a call from another ranger. All I picked out was “chui,” Swahili for leopard. Finally! 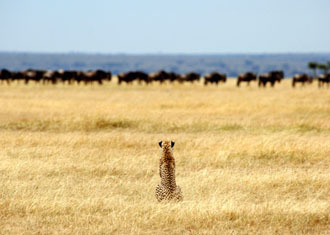 The holy grail of all African wildlife. Arnold punched the gas, driving quickly for about a half-hour. Then there Miss Chui was, slumbering in the top of a tree, nearly completely occluded by gnarled limbs and thick leaves. Sasakwa, the last of the three Singita lodges we visited, crowns a hilltop overlooking the vastness of the Serengeti. It is stunning. “Being up here with these views puts the entire Serengeti into perspective and just how far it goes,” said assistant lodge manager Christopher Ford. I pondered getting a job there washing dishes, making beds, mowing the lawn — anything to see that view every day. 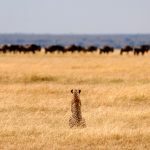 The Serengeti is a tremendous introduction to Tanzania, but when you return or even extend your first trip, there’s always the “second safari” to lesser-known areas. 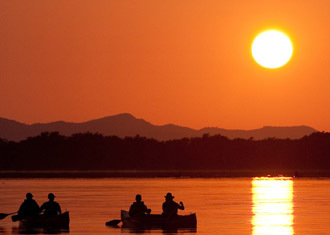 The untouched wilderness of the Selous Game Reserve is one of those places. Americans have yet to discover the Selous (pronounced “sa-loo”), a UNESCO World Heritage Site and the world’s largest game reserve. Only a handful of camps dot the Selous, including the Selous Safari Camp where we stayed. 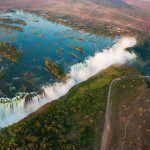 Like the Serengeti, it is home to the Big Five, untold numbers of impala, a lake filled with crocs and hippos, and those bazillions of birds. Everywhere sunbirds, bee-eaters, weavers, rollers and herons flit from tree to tree in the primary and pastel colors of yellow, green, blue, red, lilac and pink. Our next stop was Jongomero Camp in Ruaha National Park, another perfect spot for a second safari. The very uncrowded Ruaha is characterized by its diversity of open plains mixed in with riverine forests, savannas and acacia woodlands. Parts of it are so lush and thick that you can practically be standing next to an elephant and not see it. So many giraffe are here that a Dutch couple jokingly called it Giraffic Park. 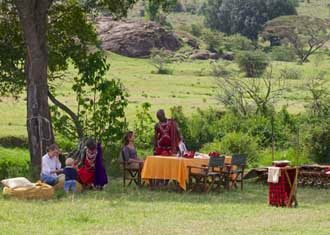 The camp is not fenced and Maasai warriors — the askari — accompany you everywhere, lest samba (Swahili for lion) might be lurking in the tall grasses. Then there’s Ngorongoro, which takes safari to an entirely new level. 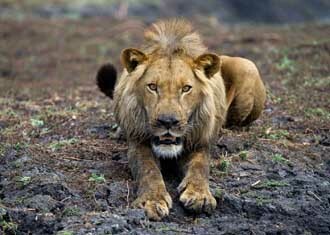 Ngorongoro, once an active volcano a few million years ago, is the world’s largest intact caldera. 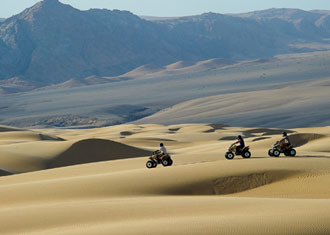 Nearly 2,000 feet deep, it is a virtual Garden of Eden, sheltering one of the most dramatic wildlife havens on Earth. More than 30,000 critters graze its pastures at any given time, not including the birdlife and flocks of pink flamingoes that flood the lakes in an explosion of color. For the predators like lion, leopard, cheetah and hyenas, Ngorongoro is like a big open buffet for tamer creatures like buffalo and zebra. There are few hiding places in these high open plains, leaving a natural collision course waiting to happen. Ngorongoro, which means “deep” in Swahili, is home to Maasai pastoralists who predominantly inhabit the conservation area, tending to their cattle and goats in a peaceful coexistence with the wildlife. 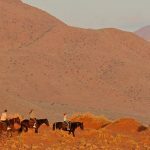 Only five hotels rim the crater, and Extraordinary Journeys, which set up almost our entire itinerary into Tanzania, selected for our group Ngorongoro Crater Lodge. The luxurious lodge, at about 8,000 feet in elevation, stands sentry over the crater and its terraced slopes. The view is simply unreal. Yes, I think, as is all of Tanzania.